2. DHL Global Forwarding (CZ) s.r.o. 4. GEFCO ČESKÁ REPUBLIKA s.r.o. 9. GTL, spol. s r.o. 10. O.K. Trans Praha spol. s r.o. 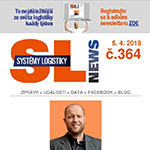 Continental AG, Coca-Cola HBC Česká republika, s.r.o., Volkswagen Logistics GmbH & CO. OHG, IKEA Supply AG, Bridgestone Europe NV/SA, Pirelli Deutschland GmbH, Kimberley & Clark s.r.o. 13. TRANSEXPRESS Intl. spol. s r.o. 14. CN Cargo spol. s r.o.